A boy in wheelchair and his teenager friends using a smartphone outdoors. Slow motion. A teenager boy with disabled grandmother in wheelchair outdoors on the street in winter, talking. 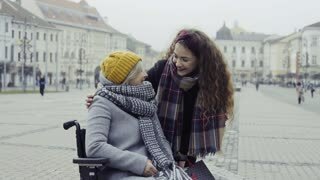 A teenager girl with disabled grandmother in wheelchair outdoors on the street in winter, talking.